I'm now on BlogLovin! Add me! Today's Outfit and Shopping list..
What I wore today Dress From New Look, Got this about 4years ago, Shoes from MinkyShop.com. 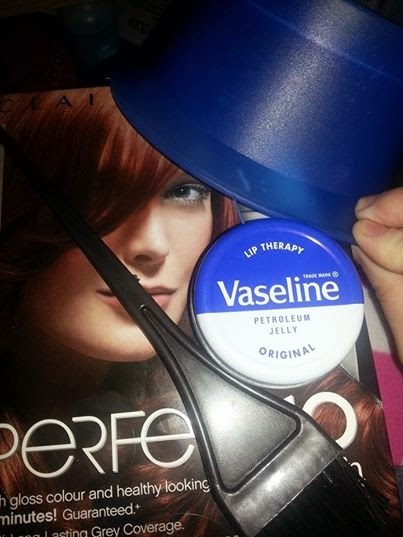 Vaseline is well known for making lips nice and soft but less known for hair dying! Rub a little bit where the hair line is and this makes it easier to take the day off in the shower! The dye Nice&Easy Perfect 10 Light Auburn 6R Was very easy to mix this up, the instructions are very easy to follow! This was easy to put on hair, did not take alot of time as this is just a 10min dye, so very good for anymore who don't have much time! Not the best pic, Me with the dye on. When it came to wash off, It came off very well, water did go red! only took 5mins! The conditioner was nice. But this did make my hair feel dry :( But a hair mask should fix that!